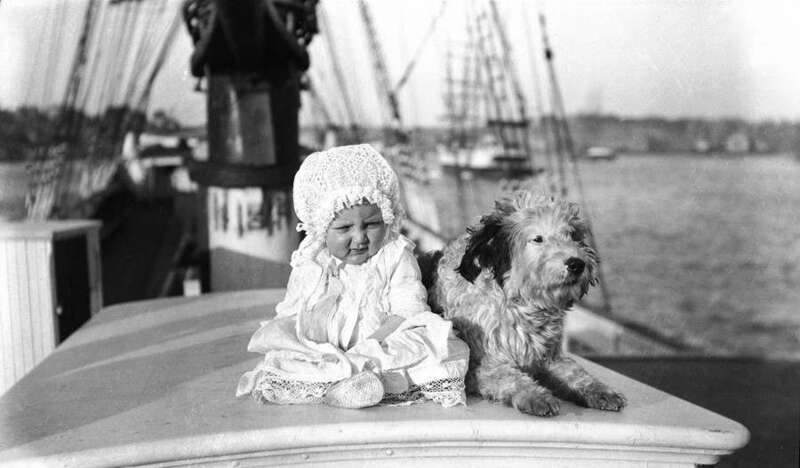 Portrait of a baby and a dog on a ship. Image: Samuel Hood / ANMM Collection 00023789. Cats, dogs, monkeys and birds have been cherished on board ships for as long as people have made sea voyages. In a life from which children and families are usually missing, and are often very much missed, pets provide a focus for emotions and affection – although cats and dogs may have been expected to earn their keep catching mice and rats, too. The prolific Sydney commercial photographer Sam Hood, who was active between 1900 and the 1950s, had a particular interest in recording the shipping that passed through our harbours. As well as making photographic portraits of the vessels, he boarded countless ships and took hundreds of photographs of crew members who purchased them as souvenirs or to send home to families. In the early 1990s, the museum acquired Sam Hood’s entire maritime output of some 11,000 glass plate and nitrate negatives, which have been conserved and scanned to form one of our most valuable research collections. The 14 photographs on Flickr are the pick of Sam Hood’s studies of seafaring animals. 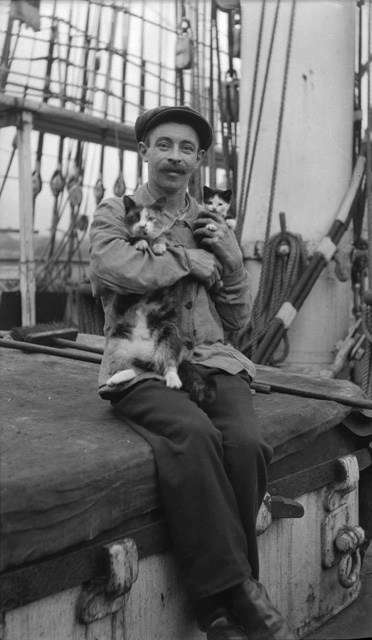 Sailor with pet cats sitting on hatch cover. Image: Samuel Hood / ANMM Collection 00036908. 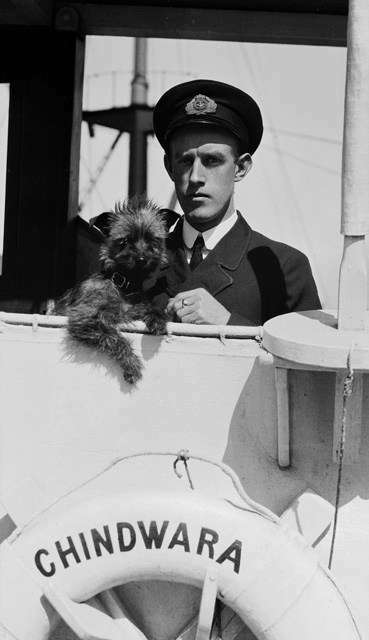 Portrait of ship’s officer with pet dog on SS CHINDWARA. Image: Samuel Hood / ANMM Collection 00020953. 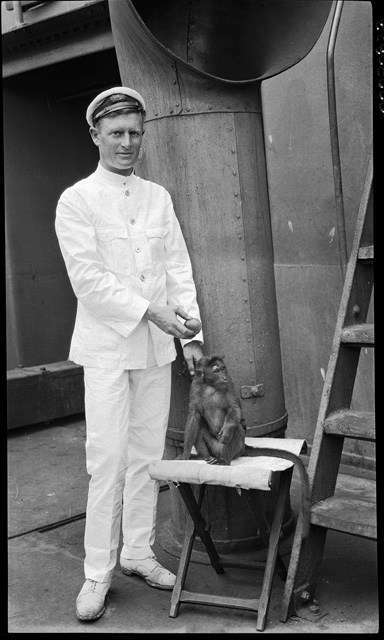 An officer in white uniform with a pet monkey. Image: Samuel Hood / ANMM Collection 00020838. 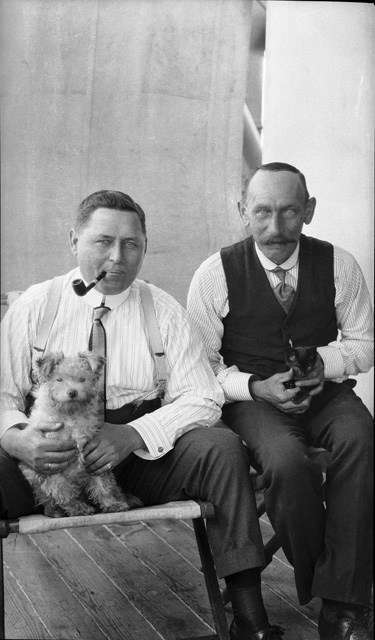 Two crew members holding pet dog and cat. Image: Samuel Hood / ANMM Collection 00023639. 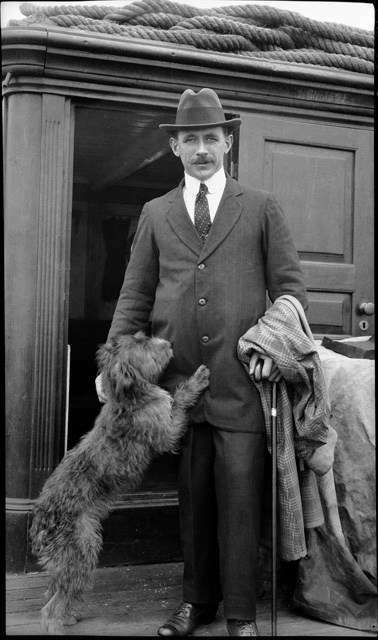 Ship’s officer with pet dog. Image: Samuel Hood / ANMM Collection 00021983. 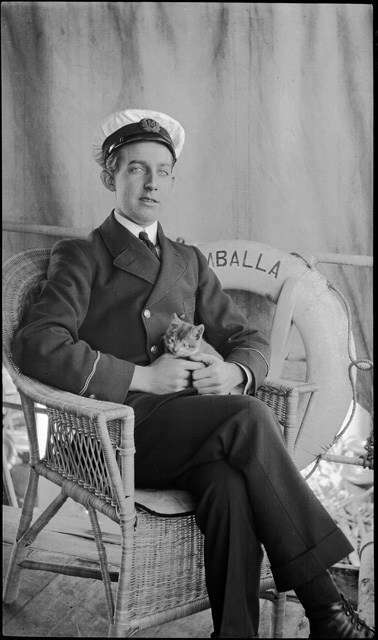 British India Line officer, nursing pet kitten, SS UMBALLA. Image: Samuel Hood / ANMM Collection 00020799. 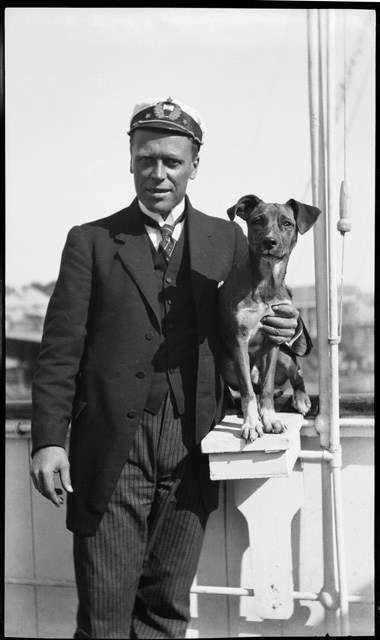 French ship’s captain on the deck of a ship with his pet dog. Image: Samuel Hood / ANMM Collection 00020744. Nearly all the photographs are posed formal portraits. In some this imparts an appearance of solemnity both to person and pet. A dog sits within the encircling arm of a young British India Line officer on the ship Chindwara, both of them equally serious faced. 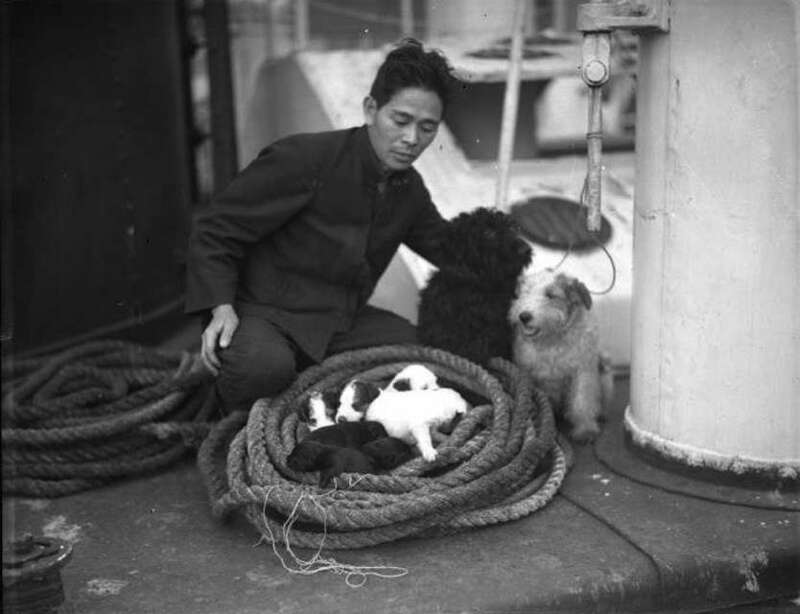 A Japanese seaman on the Mitsui Line cargo ship Yahiko Maru poses with a litter of puppies nestling in a coiled line. Sailor on YAHIKO MARU with two terriers and a litter of puppies. Image: Samuel Hood / ANMM Collection 00035951. 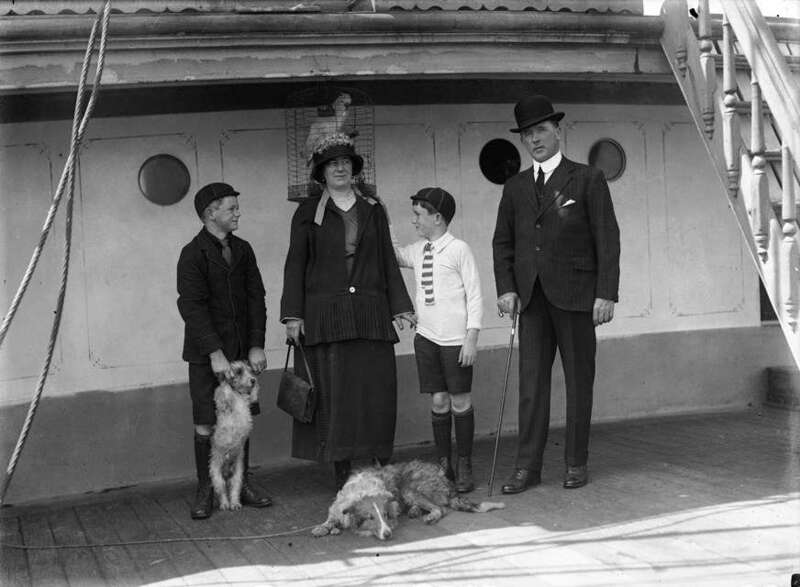 Group portrait of a family of four with two dogs and a parrot in a cage on the deck of the ship MOUNT STEWART, believed to be Captain M C McColm and his family. Image: Samuel Hood / ANMM Collection 00036760. 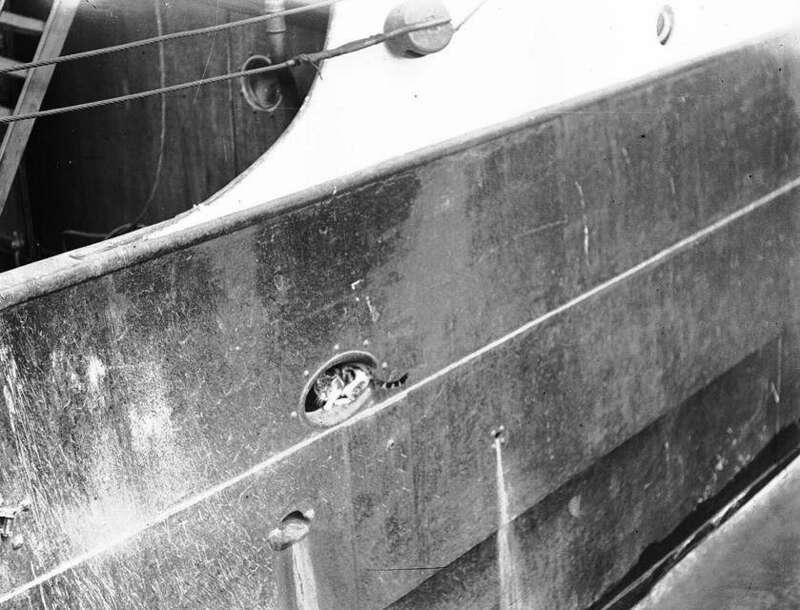 A cat sitting in the fairlead (opening in the ship’s side for cable) of the barque PAMIR. Image: Samuel Hood / ANMM Collection 00024737. Formal crew picture with ship’s cat. Image: Samuel Hood / ANMM Collection 00023816. 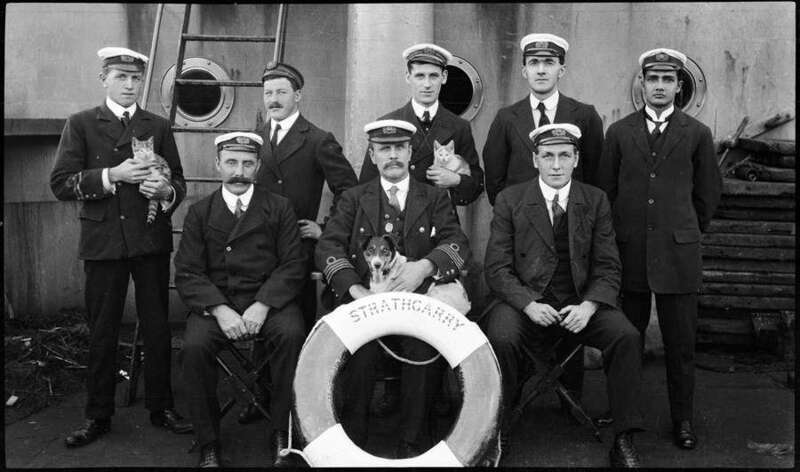 Group portrait of 8 ship’s officers on SS STRATHGARRY. Image: Samuel Hood / ANMM Collection 00020185. 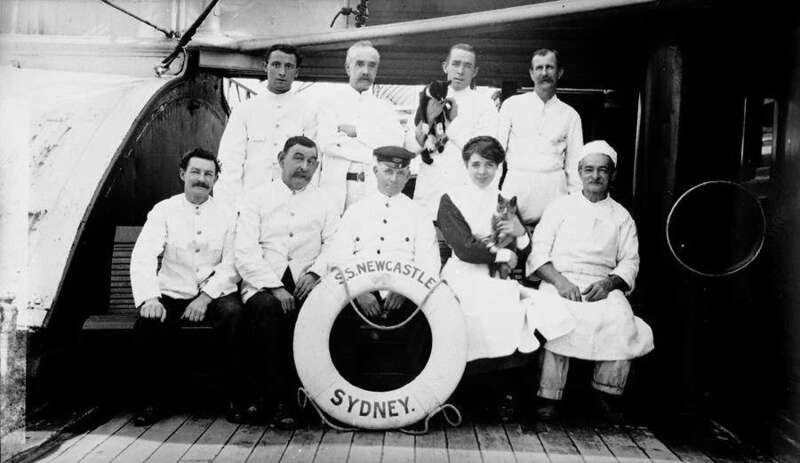 Two cats appear to be important inclusions in the portrait of the catering crew of the paddle steamer Newcastle, a ship that did the overnight run between Sydney and Newcastle for 40 years. A ship’s cat balances in a fairlead high up the topsides of the famous Pamir, one of the last commercial sailing ships on world routes. The cargoes of grain that it hauled would have provided happy hunting grounds for hitchhiking rats and mice. 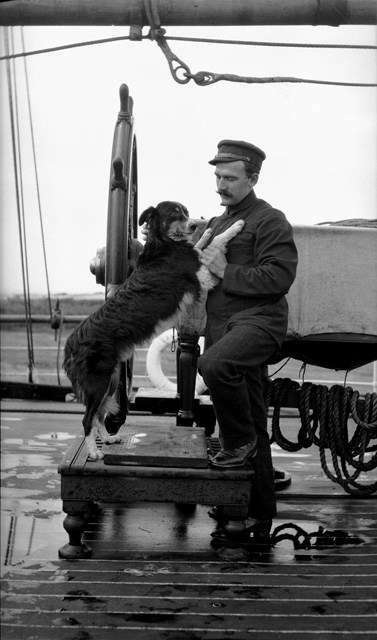 Ship’s officer with pet dog, posed at ship’s wheel. Image: Samuel Hood / ANMM Collection 00020309. Every photograph shows a clear attachment between the people and their pets, right down to the bonneted baby perched on top of a deckhouse with a calm-faced woolly dog by its side. The child may have been part of the Captain’s family living on board the ship, which was not uncommon in this era. — Patricia Miles, former Curator at the museum. This post is adapted from an article featured in Signals 82 (March–May 2008). Want more maritime pet adventures? You should read Bailey’s blogs about life as our Assitant Director of Seagulls.